Cornwall’s history is strongly linked with the life of King Arthur, with Tintagel Castle (0370 333 1181) believed to be the legend's birthplace. Now open for the public to live and breathe this exciting past, the castle is well worth a day's exploring. The site of King Arthur’s last battle, The Arthurian Centre (01840 213947), is also close by. This centre stands as an exhibition to the life and death of King Arthur, including illustrations and paintings, which bring the King to life, along with displaying his haunting grave stone next to the fields of his final battle with Mordred. Why not head south to this coastal attraction that lies within Cornwall’s area of outstanding beauty. Small fishing ports and restaurants with locally sourced seafood are just a few of the finer details of area, not overshadowed by the tall granite sea walls that work as a shield from the powerful Atlantic gales or the picturesque, postcard-ready sandy bays with both rocks and seals bobbing in and out of the waves. Take a trip to the tip of the Lizard, which stands at the southerly point of the UK’s mainland. Standing here allows for a view of the spectacular Cornish sea which is crossed by hundreds of ships as they head out to the open Atlantic. Can’t tear yourself away from the beauty of the Lizard? why not stay the night? With Glampotel Lizard Point offering all the authenticity of camping, with a little added luxury. As the highest point of Cornwall and encompassing the county's highest peaks, Bodmin Moor is a great inland treasure away from the busy coast. The hilly moor covers 150 square miles and demonstrates Cornwall at its wildest, creating a magical atmosphere with old standing stones, the final resting place of King Arthur’s sword and tales of smugglers galore. Poldark fans, this is one for you. The cast and crew of the show found themselves in Bodmin Moor whilst filming in Cornwall, with iconic scenes of the cast on horseback shot here. Bringing the show to life, Bodmin Moor acts as a place of passion, rugged character and wildness. With camping sites close by including Ruthern Valley Holidays, Bodmin Moor is easily accessible for those who wish to stay inland, or just fancy a day trip to the least populated part of Cornwall. The Eden project (01726 811911) is a fun-for-all-the-family day out, appealing to children and adults alike. What was once solely a visitor attraction has expanded to a unique resource for education and knowledge, whilst continuing to work towards a sustainable future. Curious children can flourish under the Cornish sun with workshops allowing them to have fun as they explore the vast biomes and outdoor grounds. While, for the adults there are also music concerts and gigs, art exhibitions and locally sourced food served in the café and the restaurant. Receive 10% off your ticket when booking online, and explore and enjoy mankind’s relation to plant life. Plus, there's a handy YHA campsite right on the doorstep. At National Trust protected Godrevy point, stands Mutton Cove home to a fascinating resident grey seal colony. Located on the Northern point of St Ives Bay, Godrevy Island’s lighthouse is said to have inspired Virginia Woolf’s novel To the Lighthouse. Enjoy the best of the sweeping views and the seal-spotting opportunities by staying at a nearby campsite. 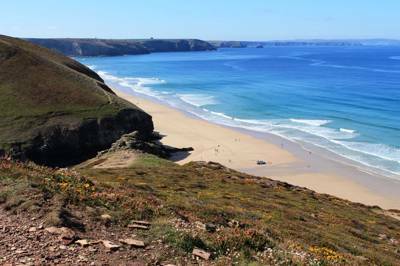 The Cornish Coast spans almost 300 miles, unarguably allowing for something for everyone, from sandy beaches, to wilder oceans, with campsites situated all over. Cornish Riviera is Cornwall's stunning south coast, with the Atlantic Ocean wildness not being for the faint-hearted, covering the north coast. There is a number of walking and hiking trails along the coast, with perfect views for all of the family.